Lewiston— The Lewiston community came out to support its emergency responders and to kick off National EMS Week on Sunday. Lewiston resident Ione Kessler was eager to show her thanks to the Lewiston Volunteer Ambulance Service. Not long ago, the ambulance crew held Kessler's life in its capable hands. In mid ­April, Kessler was home alone gardening when she felt a pain in her shoulder and back. After some rest, the pain receded. The next day, the pain returned, and it was worse than before. Kessler called Sandy Nisbit, a friend and emergency medical technician who lived only two blocks away. Nisbit relayed the call to the ambulance crew and to volunteer fire department members. "I don't think it was two minutes until she (Nisbit) got to the house, and from there on, the house was filling up with people," Kessler said. Nisbit, along with responding ambulance Crew Capt. Nick Haag and EMTs Kelly Dahl and Elizabeth Wirt, used a new piece of equipment to determine Kessler was experiencing a severe form of heart attack. The 12­lead defibrillator and heart monitor showed exactly what the emergency responders needed to see, and they transported Kessler to Mayo Clinic Hospital ­ Saint Marys Campus in Rochester for a life­saving procedure. The EMS crew was recognized Sunday at the Lewiston Fire Department, where Kessler greeted crew members like family. Lewiston Ambulance Director Matt Essig displays a 12­lead defibrillator and heart monitor that an ambulance crew used to treat Ione Kessler, pictured at left, when Kessler experienced a heart attack in April. 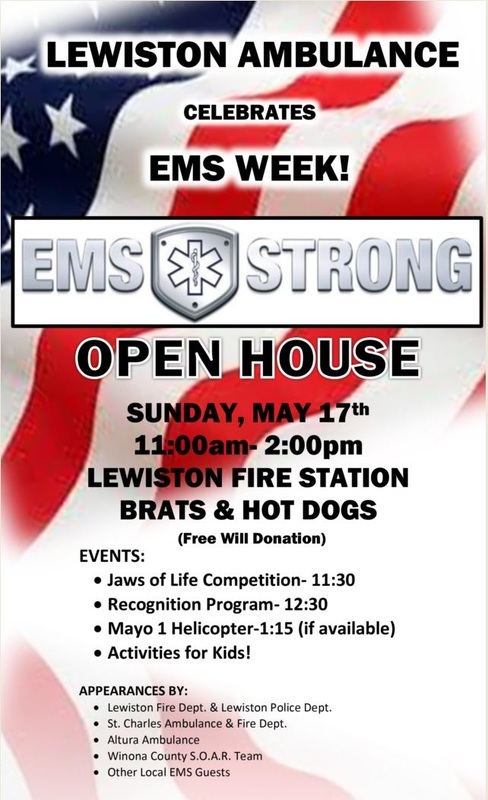 Matt Essig, Lewiston ambulance director, said the Sunday event and National EMS Week is an opportunity to get acquainted with the community and introduce some of the equipment and technology the crews use, all learned on volunteer time. "The volunteer hours that are put in to make that whole thing happen is absolutely amazing, and it's not just here in Lewiston; it's everywhere," Essig said. Essig added the open house at the fire station was meant to make the community more comfortable with the community's emergency responders and not to paint the men and women who volunteer as heroes. "But they are; they are heroes," Kessler said. The time and training volunteers commit to it can be onerous, but as Nisbit found out, it also can be hugely gratifying, particularly when a 40­year volunteer has the opportunity to assist a close friend and neighbor. "It makes all of your years of volunteering worth it — every minute of it," Nisbit said. For more information on National EMS Week, see www.acep.org/emsweek or www.emsstrong.org.